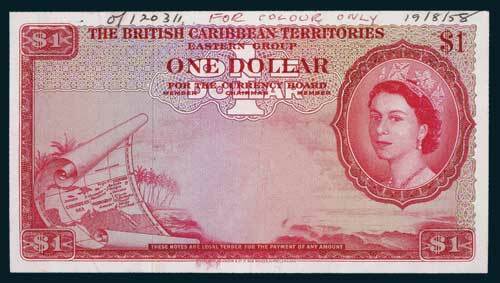 BRITISH CARIBBEAN TERRITORIES, Eastern Group Currency Board, Elizabeth II, specimen colour trial, one dollar, undated (1953-64), imprint of Bradbury Wilkinson & Co Ld, New Malden, Surrey, England, no serial number or signatures, printer's instructions 'O/120311-For Colour Only-19/8/58' in top margin on front (P.7s/ct). Extremely fine. In a holder by PMG as 45 Choice Extremely Fine.